How To Practice And Prepare For Observing And Photographing A Solar Eclipse! 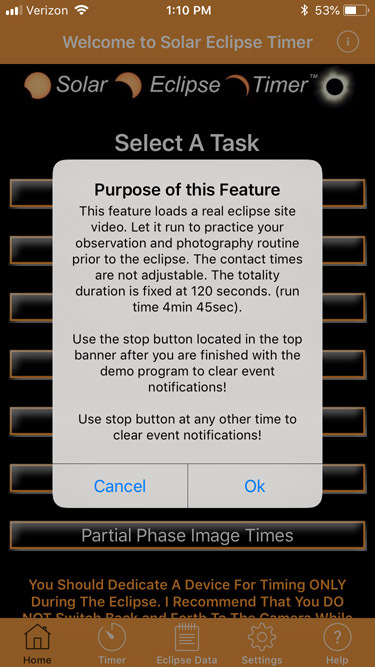 The Solar Eclipse Timer app has an extremely unique and powerful training too, which is the built in eclipse site video that is synchronized to the app timing fumctions. I was the first one to release a feature such as this to the public. The development of this feature is based on my experience from the past and the way I use to practice. I wish I had a way, in words, to convey to you what a convenient, useful and important feature this is. I need to review some history with you. In 2001, (before YouTube) I found a short video on the internet taken by Fred Espenak of an eclipse with the sounds of his excitement and the crowd's excitement in the background. I would practice my photography routine in the living room with that video playing loudly on my TV. I did the best I could, practicing my routine trying to estimate the timing without any real timing markers. The idea of doing it while playing loudly is to get use to "tuning out" the crowd distractions that will occur on eclipse day. Then in 2002, I used Fred's video again, but now I had the benefit of my first "talking timer' program, so I could actually hear countdowns to practice to. The problem was that is it was all manual! So when I would finish a photography practice session I would stop the video. Then I would have to calculate the new contact times, to use as clock times, that would be about 20 minutes ahead in the future, to have enough time to enter all the data manually into my timing program. And then reset the photography gear and queue up the Espenak video again. Then to practice, I would have to click my laptop to start the video just as the timer was preceding 2nd contact by about 30 seconds. So, with all of this manual work, at most I could get in about 2 practice routines in an hour. It was great having the "talking timer" to practice to, it was amazingly helpful, but it was time consuming and not efficient. But due to the computing power of smartphones, I have this all pre-programmed and automated for you! 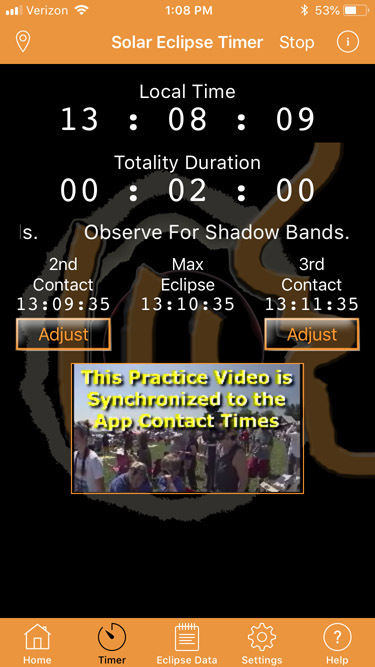 With a tap of a button, you can start an eclipse site video (mine) with crowd noise and it is automatically synchronized to the announcements in Solar Eclsipe Timer. You can practice your observation and photography routing starting at 90 seconds before 2nd contact, work through a 2 minute totality and practice all the way through and after 3rd contact! And the beauty is that you can start it over and over and over! If you mess something up, you can hit the STOP button in the top right banner and stop the video. Then re-set your gear and just start it again! It always re-synchronizes to your device clock time! It is super efficient and perfectly precise! You can watch an eclipse photography coaching video here. I takes some historical perspective to appreciate this feature, but I encourage you to use it to practice your photography plan for the eclipse. I had many people from the last eclipse contact me and tell me how helpful it was for them. They were amazed at how intense the period around totality is and they were amazed how quickly it went by.